With Master Measures, keeping your charts and data standardized organization-wide is a breeze. 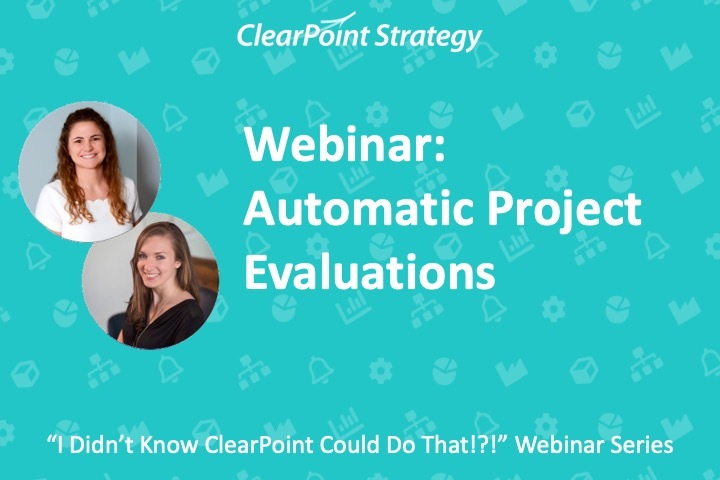 Join us to learn how this ClearPoint 11.5 feature allows you to update calculations, evaluations, charts, and more, across several measures at once. Learn best practices, too, for taking advantage of Master Measures. 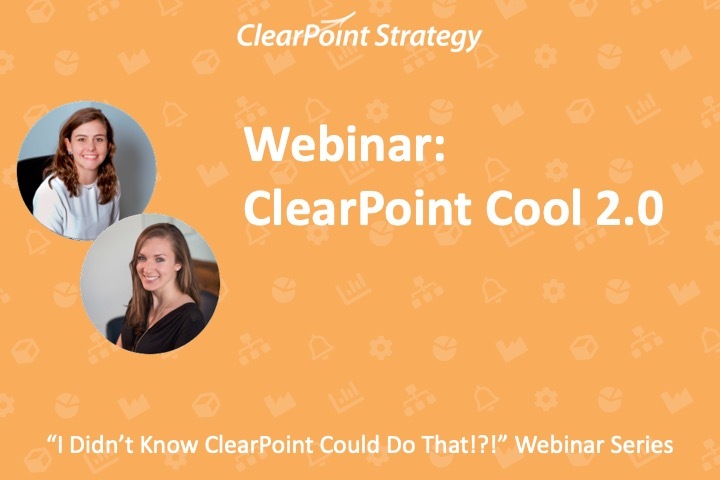 On our last installment, we introduced our newest version of ClearPoint, ClearPoint 11.5, and if you’re still getting a feel for all the functionality we’ve added, I’d highly recommend checking out the recording on our blog, Vimeo channel, or support center – just search “Webinar”. Today is going to be focused on one of those new features in particular, Master Measures. And show you how to make adjustments to master measure templates. Alright, now let’s dive into our Upward Air account, and before we get started, we want to give you a little more background on Master Measures. Catherine: So, what exactly is a Master Measure? A master measure is a type of template that you can use to apply consistent settings to linked measures across your account. The master measure template can determine what series will be tracked in your measure, what calculations those series will have, what evaluation criteria your measure will use, and what charts you have based off of those series. Tricia: So, when should you take advantage of something like that? Catherine: Because all these specifications are centrally applied via the master measure, you’ll want to use these templates for measures that are all going to be the same. So, for example, let’s say your account is broken into divisional scorecards, and each division has a Revenue measure. And let’s say you need those Revenue measure configured the exact same way, since it’s easiest to compare data and set up reports for your executive team when everything’s consistent. You can use a master measure to save time setting up the measures and making updates. Tricia: And how does it save you time? Catherine: Well, for one, instead of setting up calculations, evaluations, and charts for each new revenue measure, all you need to do is link the new measure to your master measure template. And since that template is stored centrally in Admin Options, departments won’t be adjusting calculations and evaluations individually – which saves you from having to verify down the line whether everyone’s still using the same calculations and criteria. And lastly – here’s the real time saver – whenever the format of those divisional revenue measures all need the same change – for example, an additional calculated series? All you’ve got to do is adjust the master measure template once, and the change is applied everywhere. Tricia: Awesome. So again, master measures come in handy for a set of measures that you want to keep totally consistent. Catherine: Right. And we know it’s kind of hard to talk through this without seeing it in action, so let’s go ahead and set up some examples, and we’ll point out these benefits along the way. Catherine: Now, Master Measure templates are set up based on measures in your account. So, whether you’ve already got a measure in mind, or you’re setting up something new, you’ll want to have an existing measure to use as the basis for your template. We’ve got our Monthly Revenue, Target Revenue, YTD Revenue, YTD Target, and Variance. Both the monthly and YTD values are automatically evaluated, and we’re using the “Best Series” evaluation for the measure overall. We’ve got a chart for the monthly values, and a chart showing the YTD values, by quarter. We want all revenue measures to have these exact series and charts in the Corporate, Eastern, Central, and Western divisions. So, let’s set up a Master Measure template. We’ll go to Admin Options, and under our enterprise plan features, we’ll select Master Measures, and click to Add New. Tricia: Now here’s something important to note – once you create this Master Measure template, it is not linked to the original measure! Tricia: So even though we used the format of our Revenue measure for this template, changes to the master measure don’t affect the original measure, and vice versa. The master measure is its own entity now. Catherine: Right, so we can edit the template, and make a change to the name to reflect that it’s a template. And on the series and charts tab, we’ll see the series and charts that will be applied to any measure using this template. Then, we’ll want to link the template to our other Revenue measures. So first let’s take a look at one of our existing revenue measures. And we’ll go into the Western Division, to the revenue measure there. So here we’ve got a Revenue measure that isn’t using quite the same format we would want – We’ve got Actual and Target, which aren’t using the same naming conventions that we wanted, and % of Target, which isn’t something we’re interested in tracking anymore. So, let’s go ahead and link this measure to our master measure. Now there’s a couple of places you can do this. There is a place to do this right in the Edit Measure window, which Tricia is going to show you, but for this example, let’s go back to Admin Options and link it from there. So back to Admin Options > Master Measures > Edit Measure > and this time we’ll go to the Measures tab. Here I can add our links. Tricia: linked measures are going to be any measures in the account that we want to have using the structure of the master measure template. Catherine: Yeah, and the nice thing about linking here is that I can link all my revenue measures at once. So, we’ll go through Eastern > Revenue, Central > Revenue, and Western > Revenue, then click Link Measures. So now, let’s go back to that Western division Revenue measure. I can see that I’ve got several new series in the data table. My master series were added here at the end, and we’ve got the original series that were here in this measure. So, let’s just do a little cleanup, to get rid of those default series. Because our calculations and evaluations here are using the master series, we want to copy/paste to transfer the data there. That’s going to allow everything to compute. And if we click into the Edit Measure window, ClearPoint’s got an easy way to differentiate between the default series and master series. Let’s go to the Series tab, and you’ll see that all the master series are in Orange to easily show that they’re part of the master template. You can’t edit or delete them, but you can disable them, which we’ll come back to. And let’s go ahead and take out those series that don’t match up with our desired format. So same thing on the Charts tab, you can see that some of these charts are master charts, and we’ve got one that was in the measure by default, which we’ll delete. and this is what our cleaned-up, final version looks like. Now, whenever we acquire a new division, I can easily add a Revenue measure with this exact format. AND, as you’ve seen, those series have to be edited from Admin Options, so everything stays consistent. Now you’re probably wondering, what are some other scenarios where you can take advantage of master measures? Great question Catherine! Another great example of a way to use master measures is with Citizen Satisfaction Survey measures. A lot of municipalities have Citizen Satisfaction Surveys that they distribute and record data from once a year. Catherine: And it’s likely that many of your questions will be formatted to have the same options – like a five-point scale ranging from most dissatisfied to most satisfied. So, setting up a master measure with these responses as series would be a great way to standardize the survey measures. Catherine: Wow, we’re not even including satisfied responses in our evaluation? Tricia: What can I say I’m a perfectionist! So, let’s set up a Master Measure. We’ll go to Admin Options > Master Measures > Add New. And we’ll choose the Scorecard and Measure that are going to serve as the basis for our template as we saw Catherine do but now I will choose the Citizen Satisfaction Survey measure. So, you might be wondering whether you should be using Master Measures all the time!! For everything!! It might appear that they are interchangeable with, or even better than, Default Series. BUT, looks are deceiving, and there are separate use cases for Master Measures and Default Series. So, let’s refresh everyone’s memory on default series first. This setup component can be found under Admin Options, here in the top right. These are the series that show up in the data table by default when you create a new measure. That includes name, order, and their data type. So, your default series are a template that is flexible and easy to change. Default series are a better option than master measures in organizations and scenarios where measures are not perfectly similar. You can easily adjust measures individually, change your default series without disrupting previously created measures… they’re meant to serve as a flexible basis for the information in your account. Tricia: By contrast, when you use Master Measures, you should not be expecting to make tweaks and changes individually to those linked measures. Tricia: The whole idea behind leveraging a Master Measure is that changes would have to be applied centrally, by the administrator, to make sure that results are kept consistent. So, you’ll want to reserve master measures for instances where measures are not expected to change separately, and this rigidity becomes an advantage. Now, of course, Default Series and Master Measure Series are bound to meet, since, when you link a new measure to a master measure, those defaults are already going to be in place. And one important note to keep in mind there is that series names in ClearPoint need to be unique. So just be aware that, if you do repeat default series names in a master measure template, ClearPoint will differentiate the master series names by adding a suffix, like an underscore 1 at the end. Now you might be wondering what other defaults you can set up in ClearPoint. Another great default option is setting up the default layouts for elements. This means that all detail pages are going to show the same fields and types of information. Catherine: Ok I see, here you can set up a separate default layout for every element in your account. Here I can type in the name of the Measure into the element and see the dropdown will load measures to choose from, choose a measure and save. The only difference is that we only have one chart, so there’s just the one chart showing here. Along with setting a default layout, we can set default charts. This will set the same chart type for every newly added measure. This dropdown will populate with all standard and custom charts in your account, so you can even set up custom charts as the default chart type. For this example, we will choose the Line chart as our default chart type and save. Now, when I go to add a new measure Employee Salary and enter in some data, I can see the Line chart populate for this measure. Setting a default chart is a great way to save some time when a majority of the measures in your account will all use the same chart type. Catherine: Those are great options to know about! Now while we’re talking about time savers, I do want to jump back to master measures and show you one of the major benefits of having measures linked. Now let’s go back to our example of the Revenue measure. So let’s say that after a year of tracking revenue this way, everyone is happy about the consistency, but someone in leadership has decided that you really should be looking at Year to Date variance too, and not just monthly. Normally, you’d have to go into each revenue measure, add this series, and add a calculation to that new series, but now, we can do this in just one place from our master measure! So, let’s go to Admin Options > Master Measures > Edit Measure, and over to the Series tab. Name it YTD Variance, and add in our calculation. So, this is going to be YTD Revenue minus YTD Target. Now let’s save the template and go take a look again at one of our linked measures. And if we go into any other linked measure, like in our Eastern Division, the change is made there too. Tricia: Wow! We’ve made changes to multiple measures at once with just that one change to our Master Measure template. So, we know that not all changes to measures involve adding things – you might be wondering how to delete things from Master Measures, too. Catherine: Yes, there are actually two ways to delete things from your Master Measure templates. Let’s walk through a couple of scenarios where you might use them. So, say we don’t need our monthly variance anymore – we’re just going to look at YTD Variance. We want to fully get rid of that monthly variance series so that it doesn’t confuse departments as to what numbers they want to be looking at. Or leave it in those linked measures, but no longer have it be connected to the Master Measure template. We want to do the former, so we’re going to click on Delete. And that’s going to wipe the series from our linked measures. But I do want to show you how that Unlink example works, too. Since we’re more focused on the YTD now, maybe we don’t want to require this monthly graph of revenue anymore – and we don’t want it added to any future linked revenue measures that use this template. But we want to give departments the option to view their data that way if they find it helpful. We’ll click to delete the chart, and this time, we’ll select Unlink. Instead of being fully deleted from existing linked measures, the chart will still be there for divisions to edit individually as they see fit. And again, it won’t be included for any measures you link to this template in the future. So, let’s take a look at the changes that have occurred since we made those changes, jumping back to the Western Division. Since we deleted our monthly Variance series entirely, we can see that we now only have YTD variance displayed in the Data Table. And our gauge chart is still here because we unlinked it rather than fully deleting it from the master measure template. That means we can double click to edit the chart just for this revenue measure. Now there’s one more scenario we wanted to cover, and that is, what if you want to adjust a single measure that’s linked, without disrupting the Master Measure template? There are a couple of ways to go about this as well. Tricia: As we mentioned briefly before, you do have the option to disable components of the master measure for an individual measure. What that means is that in that linked measure in particular, the disabled components won’t show up. Catherine: So, let’s use our survey metric as an example. Maybe tracking satisfaction with bike trails is a new survey metric just as of this year. It doesn’t really make sense to have this historical chart there when you’ve only got this one year of data. We’ll edit the measure, go to the Charts tab, and click Disable next to our chart. So, this is probably the best option when your changes revolve around hiding parts of that master measure template. Tricia: But what if you’ve linked a measure to a master measure template, and then realize it needs to function completely differently? Are you stuck with all those master series and charts? Unlinking means that any further changes to the linked measure can be edited individually, and won’t impact the master measure, and vice versa. So, let’s click to edit the measure, and go to the edit tab. In the same place we first linked the measure, we’ll now see a check box to unlink it. So again, ClearPoint’s going to ask us whether we want to purge any series and charts from the linked measure entirely, or whether we want to keep them there for independent updates. Let’s keep them there for now, so we’ll click Unlink and Save. So now, we still have the series and charts from the master measure template, but if I double click I’ll see I can now edit the details right from this measure. Tricia: Awesome! So, we do want to leave you with just a couple of last pointers. It’s important to remember to document which master measures are made for what purpose internally at your organization. Since other users can add or edit measures to link them to the master measure, it is important that they know the purpose for the master measure. 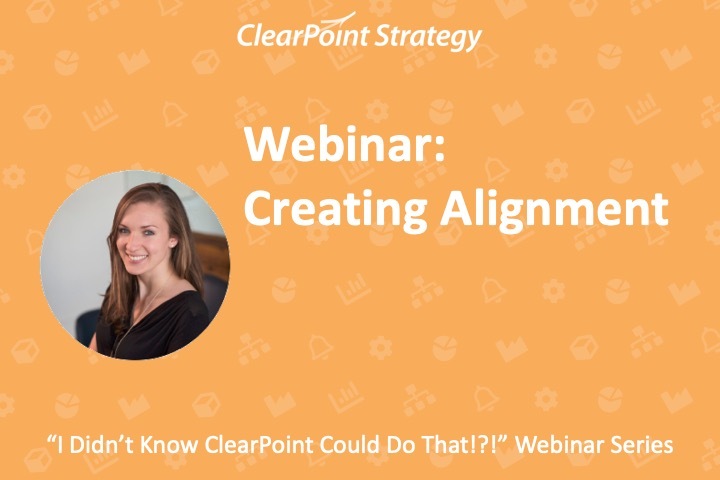 In ClearPoint, you should give the master measure a name that makes it clear what measures should be linked to that master measure template. Users should be able to look at the master measure and immediately tell the purpose of it within your ClearPoint account. Catherine: For example, the Revenue template and Citizen Satisfaction Survey template we create today have clear names so other users could tell what measures these should be linked to. Tricia: Exactly, that is crystal clear what measures those templates should be linked to! Definitely, those are good pointers to keep in mind. Alright, we’re reaching the end of our time here today, and we’re sure you’ve got plenty of burning questions that we can answer. What users have the option to link/unlink a measure from a master? As you saw today, you’re able to unlink and link from the edit window, so any users with editor or above permissions are able to link to a master measure template. Catherine: Exactly, so that’s why communication is key, since your Editors, Scorecard Admins, and Administrators have access to link measures to those templates, even though the templates themselves are restricted to administrators. Can you re enable series and charts once they’ve been disabled? Yes, that’s definitely the case, so if we click back on our revenue measure, click to edit, and go to the charts tab, we’ll click to disable the chart, and once again disabling the chart is going to remove it from the page. And if I want to re enable that chart all I need to do is un check that box, and it’ll pop right back up here on the page. What happens to your chart and calculations that come from the master measure if you disable a master series? Good question. Let’s actually take a look at our series right here in the revenue measure. So maybe this particular revenue doesn’t have a target yet, so we want to disable the Target series. And we know the Target series is contributing to the YTD Target, and by consequence, the YTD Variance. So, we can see here that those calculations are no longer going to populate because the Target Series has been disabled. So, in this case we’d also most likely be disabling those two other series since we don’t have a target in place. We can also see that there’s still a space for our YTD target on our chart, because it was set up that way in the master measure template. And that’s okay – these components are working as expected based on the master measure. So, when disabling parts of a master measure, you just want to think about the use case and potentially set up alternative series and calculations for that one measure, based on the way you plan to use and adjust it. That’s all we have time for today, thanks so much for joining us on this episode of the “I Didn’t Know ClearPoint Could Do That!? !” webinar series. We hope to see you next time, and happy reporting!